Living a healthy life shouldn’t require a degree in nutrition, health or fitness. Sharing what I’m learning during my exploration of health, wellness and living a more meaningful life. Did you know that around half of all produce in the United States ends up in the landfill? That 60 million tons equals about $160 billion of wasted food, according to a 2016 Guardian report . I admit that I've definitely contributed my fair share. As a single woman living in a large city, I find that sometimes it's difficult to eat all of my fresh produce within a week, especially if I purchase a variety so that I'm not eating the same things every day. But throwing away food is a privilege. 795 million people in the world are hungry -- that's one in nine people on the planet. It's also selfish towards the Earth and is money that you could have spent towards a more meaningful experience. I’m making a conscious effort to reduce my personal food waste starting now and I’d love for you to join me! Below are five easy tips you can incorporate into your life to reduce food waste in 2018. I LOVE grocery shopping. For my internship in college, one of my tasks was to buy groceries for the family I was working for. I would walk the aisles at Whole Foods, adding tons of fruits and veggies, freshly baked breads and meats from the butcher to my buggy, dreaming of the day when I could afford to buy as many organic items as I wanted without worrying about budget. I’m nowhere near that day, but I am definitely guilty of loading up my cart with interesting items from Trader Joe’s with zero regard for how I’m planning to cook them or eat them all before they spoil. Instead of having a free for all in the produce section, if you take time to plan out your meals, check your fridge, freezer, and pantry for food that’s near expiration or for dry goods that you can turn into a meal with a few additional ingredients, prepping before you shop can keep you from over indulging and eventually throwing out uneaten food. Tonight I took an avocado that was overly ripe and instead of tossing it in the garbage, I planned my meal around it. 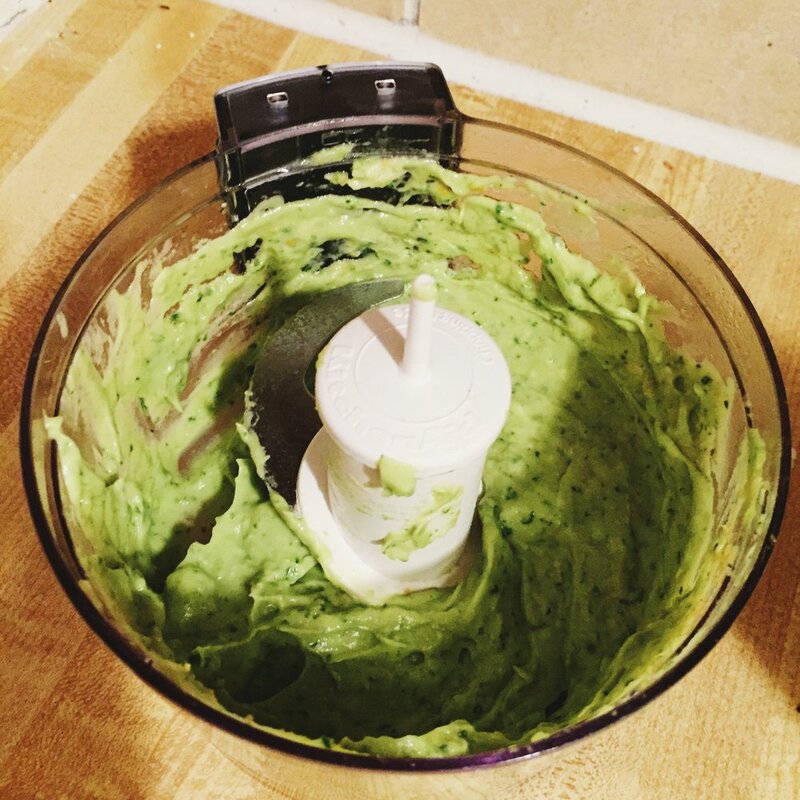 I’ve never tried the plant-based avocado sauce but I knew I had most of the ingredients on hand except for basil. I originally planned to have it with zoodles, but my grocery store was out of zucchini so I paired it with some Banza pasta for a delicious gluten free, plant-based meal. I’ve shared my recipe below, although this was just me tossing things together according to my tastes so feel free to use more or less of each ingredient. Greens that are bagged or boxed in plastic, food that’s bundled together like sweet potatoes and lemons, or meats that are prepackaged all mean that you could be taking home more food than you can eat. Instead, select your mixed greens from the loose bins, ask for an exact quantity of meat from the deli, and pick out veggies that are plastic-free. Produce already comes in their own natural packaging, so there's no need for the extra baggage. Or, if you need to bundle them up, try bringing your own reusable produce bags like these from Simple Ecology. Body positivity is finally a huge trend and women and girls are learning not only to look past their "imperfections", but to embrace them. I would argue that we have to start doing the same for food. How many carrots or potatoes or apples have you sorted over just because it didn't meet the standards of "food beauty." Meanwhile, if you chop it up and throw it in a pan or on top of a bed of lettuce, it would taste exactly the same as its perfectly symmetric cousin. I know I’m guilty of this. Can we all just make a commitment to say “screw your food beauty standards” and buy the ugly produce? For me, standard meal prep can get pretty boring. On Monday, I'm loving it, but by Wednesday it's starting to lose its appeal and on Friday, I'm questioning not only the food's freshness, but my sanity if I have to eat the same thing again. One great way to add some variety to your meals without adding extra time in the kitchen is to meal swap with a friend or coworker. You can trick your mind into thinking that you’ve purchased takeout since you didn’t make it yourself and it will definitely help fight food fatigue without wasting the food that you had to buy in bulk. Of course, there are so many more ways to reduce our food waste. If you have another tip to share, please post in the comments below and tag me on Instagram as you take steps to make 2018 more green. Throw all of the ingredients into a food processor. Pulse for 30 seconds, adding more olive oil to your desired consistency - I didn't really measure, just started with less and added as needed. Mix with your favorite whole wheat or gluten free pasta or spiralized veggie noodles and top with nutritional yeast. I think it would also be tasty as a salad dressing - maybe with a little more lemon juice or other acidic element. Makes about three standard servings. Get updates on health, wellness & living a meaningful life in your Inbox.